What do you do with luggage on ALSA buses? Do you need to check it or get a sticker/label like you do in some countries or is it like the UK and you just turn up at the bus and sling it in the hold underneath? Sometimes on the long distance buses the driver will organise the load - when you show your ticket . Some stops go in the hold at one side, others the opposite side. Then he only need open one hatch, and not have you in the middle of the road if it is not a bus station. Part frances jun 07/rest frances may- jun 2008/Frances sept-oct 2009/ Sanabres Oct 2010/Frances sept-oct 2011/Aragones Sept-Oct 2012. Hospitalero Sept 2010, Amiga in Pilgrim's Office Oct 2013. Part Primitivo Oct 2013. Portugues from Porto June 2015. Just before the driver starts taking tickets from the passengers queuing at the door, he'll open both sides of the luggage compartment or 'bodega' as it's sometimes called in Spanish. I like to push my luggage to the middle even if it means reaching over suitcases or pushing them aside to get my pack out later. The trick is to take on board all that you need, reading material, notebook, maps and of course a bottle of water. There's usually not a lot of storage space overhead, just enough for a coat but not for a case, so if you want to carry something small but bulky onto the bus, it'll have to sit between your legs. 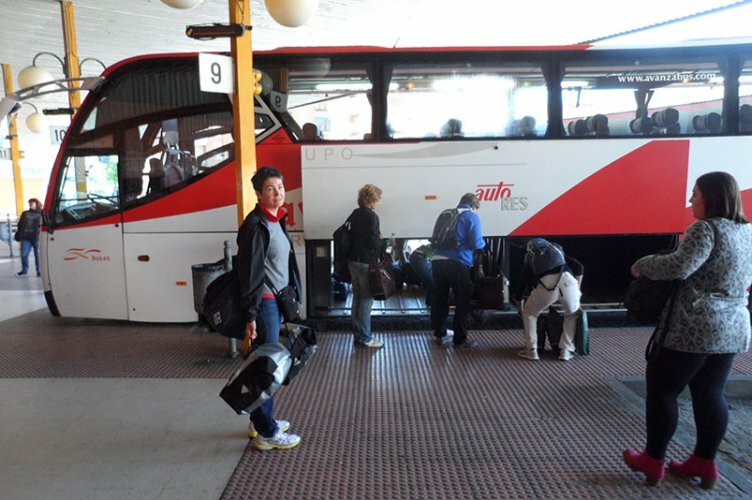 In this photo you'll see my group of 'bicigrinos', biking pilgrims loading saddlebags onto the Alsa bus at Salamanca bus station in May this year on our return from the Via de la Plata. We'll be back there next year! ....and at intermediate bus stops I like to check that my backpack is not "inadvertently" removed from the hold (bodega), particularly at stages where there are large numbers of leaving travelers, collecting their belongings. Who knows the costs of taking luggage in hold with Iberia flight?